No MLS team has ever won 14 of its final 16 regular season matches — as the Sounders are on the verge of doing — and gone on to win a championship. The Sounders hope to clean up some mistakes and avoid the playoff fatigue that's derailed many a team that peaked too soon. 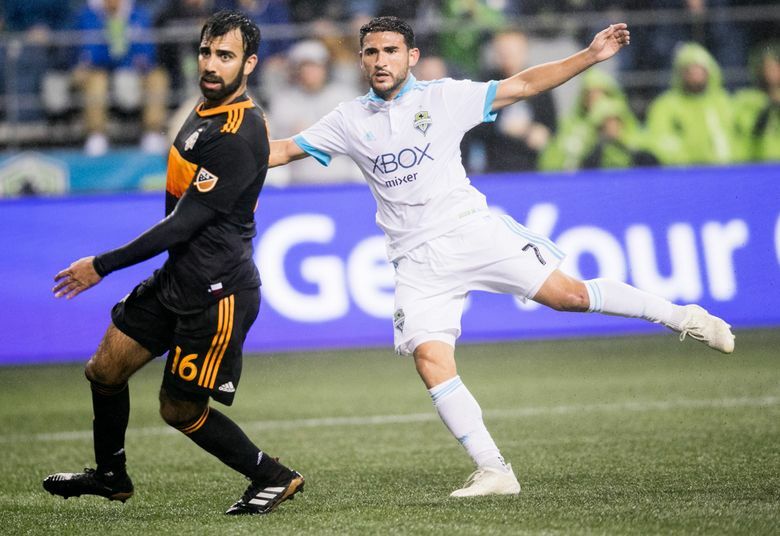 Sounders midfielder Cristian Roldan was in the midst of explaining the need for his team to better protect late leads when the question of peaking too soon was raised. His team, after all, has won 13 of 15 and is about to attempt a playoff feat no other Major League Soccer squad has achieved: Winning a championship after enduring do-or-die matches their past five months of regular-season play. The Sounders, once left for dead, will have gone a previously inconceivable 15-2-2 since July 4 if they beat the league-worst San Jose Earthquakes at home Sunday to close out the regular season. But winning at such a clip can take its toll and might explain some of their late lapses defensively in three consecutive games after they’d taken leads of two goals or more. Roldan agreed his team has already been through a mental and physical grind just qualifying for the postseason and will need to somehow elevate things from here. The history of MLS has not always been kind to teams that dazzle in the regular season. Only three of the past 15 winners of the Supporters’ Shield for the top regular-season record have gone on to win the MLS Cup title. In fact, only four of the past 15 regular-season champs even made the final. The Sounders won’t have to worry about that particular statistic since they aren’t close to finishing first overall. Their poor start the first four months of the season left them in such a hole they could barely afford to lose at all the final five months if they hoped to make a 10thstraight playoff appearance. Not only have they lost just twice since June 30, they’ve hardly tied any matches either. If they defeat San Jose, they’ll head into the playoffs having won 14 of 16 and averaging 2.63 points per match over nearly half a season’s worth of action. No MLS Cup champion has ever done that. Toronto FC set a regular-season points record last year and blistered to a 10-2-4 finish over their final 16 matches. But that’s still only a 2.13 points points-per-game clip down the stretch by a squad many consider the league’s best ever. Another all-time-best candidate, the 2011 Los Angeles Galaxy, averaged 2.06 points per match over their final 16 contests. It’s just too mentally exhausting for most professional teams to keep winning that much for so long. And only the very best avoid peaking too soon and maintaining an iron-clad focus come playoff time when the intensity gets ratcheted up even higher. Roldan feels his Sounders — finalists last year and champions in 2016 — can compete intensity-wise with anybody when stakes are highest. “I think it’s stressful having to do it the way we did it this season,’’ Roldan said. “But I think it made our team even stronger – going through this nine-game win streak, losing a game (to Philadelphia) that maybe we shouldn’t have lost and now all of a sudden we’re (potentially) back on a five-game win streak. But that means not allowing pesky late goals out of the blue. Also, putting away scoring chances that can bury teams instead of allowing them to creep back in it. Sounders coach Brian Schmetzer acknowledges the dangers of fatigue catching up to a squad that has rarely paid for mistakes with a loss since June. For now, Schmetzer is focusing on the positives of a team that keeps finding ways to win – whether in nerve-wracking fashion or not. “We’ve been pretty consistent in our coaching all year long,’’ Schmetzer said. “We do the work on the field. We watch the film. We hold people accountable. We talk to them. We boost them up when we need to. It’s that same program. And perhaps that’s enough and grinding out victories like last weekend’s 3-2 thriller at Houston will better serve the Sounders come playoff time than would a 3-0 or 4-0 cakewalk. After all, as the Sounders demonstrated memorably in winning their 2016 title, style points in the postseason aren’t nearly as important as the ability to simply prevail.